but it doesn't last. She didn't even finish her parsley (her favorite food) before she was back. Younger son put out her book - right under my chair. That worked for a little while. 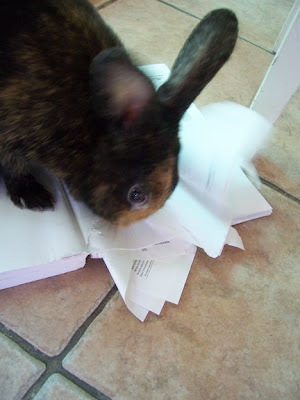 ("Mo-oommmmmm, the rabbit ate my homework!") And then she was back. I hope she gets less obsessive as she gets older. I wonder if the bunny likes your lotion. I hope it's that because if it's not, it might be a long summer for you. I would like to learn how to graft lace. I also need to learn how to properly employ the provisional cast on. I second Jamie's two statements. And Cookie might be on to something there. Could be your soap too. Might want to try Ivory and a fragrance free lotion for a few days and see what happens. And I cannot wait to see thursday's suggestion show up on YouTube. I have grafted lace, and I didn't find it any harder than grafting stockinette. (Which, come to think of it, I find pretty darned hard.) But later I wanted to take out the grafting to remove a couple of repeats and soon realized it would be easier to separate my skin from my body in one piece than to take out that grafting without destroying the project. Grafting lace; when we made the Madli's shawl for our friend for her wedding, there were four of us who knitted sections and then we grafted them together. You can search my blog for details, but it is not too difficult, it just takes some time and concentration. It turned out very nice and they only reason you could tell it was done in sections was that we had used a slightly variegated yarn and the color patterning was a little different because of this. Sounds like you have a mischievous teenager bunny! 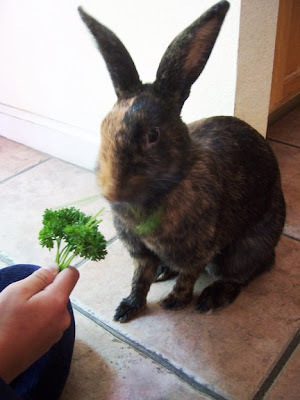 We had one that would hop up onto surfaces and start throwing things around to get our attention! be careful you don't trip over the bunny and hurt yourself! Thanks Romi, that makes perfect sense. I can't wait to try it our! Some rabbits freak out for the salt on your skin, does your bunny have a multimineral salt lick available all the time? If it's lonely (they are very social animals) try giving it a (plastic) mirror, and a nice scratchy board to scrabble the claws on (just lay it on the floor), and a hardwood dowel to nibble on.